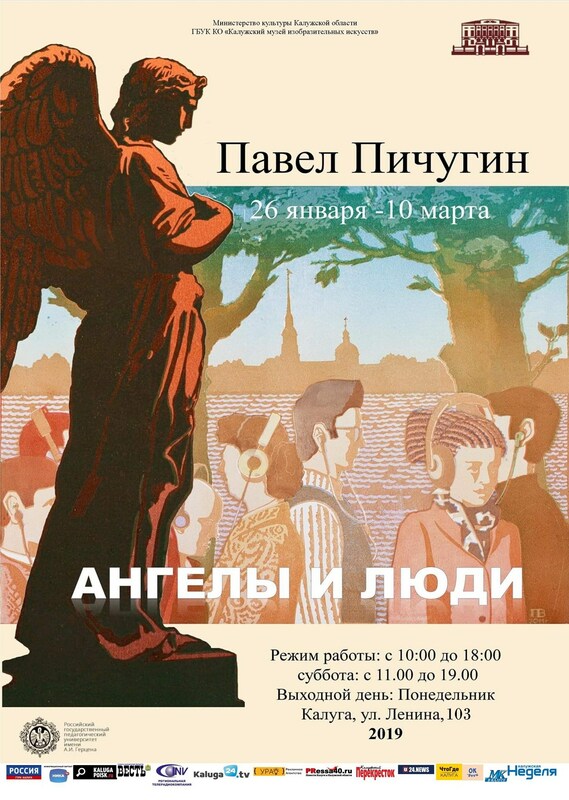 On January 26, the Kaluga Museum of Fine Arts (103 Lenin Street) opened the personal exhibition “Angels and People”, which presents works by Petersburg graphic artist Pavel Valentinovich Pichugin. P.V. Pichugin was born in 1967 in the city of Pavlodar (Kazakhstan). In 1989 he came to Leningrad, where he studied art studio to them. V.I. Suvorov. Here in 2001 he graduated from the Faculty of Fine Arts of the Russian State Pedagogical University. Herzen, and in 2007 - the faculty of graphics of St. Petersburg AG Institute of Painting, Sculpture and Architecture. I. E. Repin (Academy of Arts). In 2007 he became a member of the Union of Artists of Russia. He is currently a member of the National Society of Exlibris Lovers (NOLES) and a member of the Russian Association of Exlibris (Moscow), a corresponding member of the Academy of Folk Art (Moscow). P. Pichugin lives and works in St. Petersburg, successfully combines his creative work with teaching, he is an associate professor at the Faculty of Fine Arts, and heads the drawing department of the Russian State Pedagogical University drawing department. A.I. Herzen. P. Pichugin has worked a lot and fruitfully in different types of printed graphics (etching, linocut, lithography, engraving, and others). He is a regular participant in city, national and international exhibitions and competitions (bookplate and engraving). The artist’s works are in the State Hermitage Museum and various museums of Russia (Orel, Omsk, Tambov, Kaluga), and in foreign museums (Latvia, Riga), as well as in private collections. The exhibition presents works created by the artist over the past fifteen years. These are, above all, views of St. Petersburg and its environs - one of the main themes in his work. She received her incarnation, both in color print (colored linocut) and in watercolor. In recent years, P. V. Pichugin has paid much attention to biblical subjects. The exhibition includes selected works from this cycle, as well as linocut from the new series “Archangels”. Another direction in the artist’s work is book graphics. At the exhibition you can see illustrations performed by him for the works of Russian writers N. V. Gogol, N. S. Leskov, for a collection of poems by Russian and Soviet poet A. M. Gorodetsky (1884 - 1967). The exhibition also presents small-sized graphics - ex-libris (a bookmark certifying that the book belongs to the owner). P. Pichugin can be called a recognized master of ex-libris: in 2008 he became the winner of the International Competition of ex-libris in Poland "Gdansk Lions". All the works of P. V. Pichugin are distinguished by high professionalism and skill in execution. The artist in his work continues and develops the traditions of the Russian school, which has always been distinguished by the perfection of the artistic form and spiritually figurative content. The opening of the exhibition will end with a concert "Masterpieces of early music." The program includes vocal and instrumental works by I. Bach, G. Handel, V. Mozart, C. Franck, G. Stölzel, accompanied by The Time Ahead Moscow Musical-Theatrical Group. The exhibition will run from January 26 to March 10, 2019 in the building of the Informational and Educational and Exhibition Center of the KMII (Lenin Street, 103). The museum is open from 10.00 to 18.00, on Saturday from 11.00 to 19.00. Closed on Monday. Contact phone - 8 (4842) 56-38-20.